Darwing and Yerald are in charge of suppliers and purchasing. Cesia is in charge of decorating the product and the establishment. Anielka and Josebeth are both accountants, and Michael and Darwing are the publicists. This is the staff of the “Earthly, botanical, nutritional Eden” (“Edén terrenal, botánico, nutricional”), the enterprise of the Andrés Castro school in Chinandega, which consists of the sale of medicinal and ornamental plants, as well as fruit trees. “We buy the seedlings in nurseries or they give them to us and Cesia paints and decorates the flowerpots, or uses recycled material giving them owl shapes and making them pretty,” Anielka comments, while pointing out the different types of flower decorations in a room surrounded by flowers, shrubs, and small saplings; a room located next to the school garden. This initiative is a partnership between Teach a Man to Fish and Nourishing the Future, a project sponsored by Cargill and CARE and executed by Fabretto. 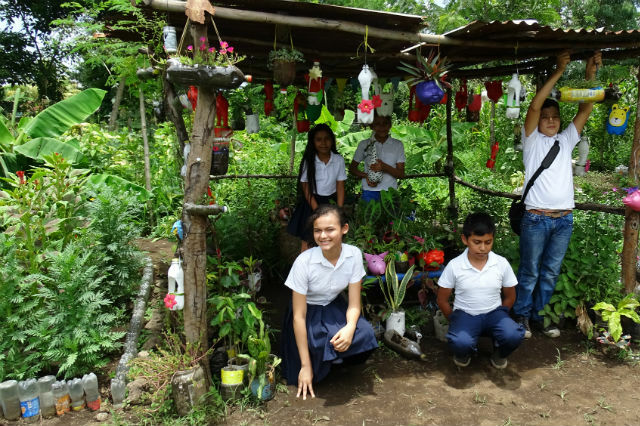 The partnership promotes student entrepreneurship in various schools in Chinandega. 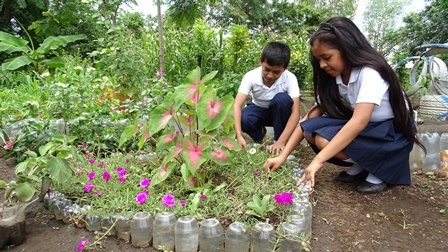 “Through this initiative, we have been able to encourage children of fourth through sixth grade to explore ingenuity, creativity, leadership, teamwork, and motivation, which has allowed them to create their own ideas with the resources available in their own community,” says Karen Mendoza, Economic Entrepreneurship Officer, of the Nourishing the Future project in Nicaragua. All this has been achieved through a process of training and monitoring for more than a year, which has been strengthening the management capabilities and development of ventures in the educational community. Manuel Ordóñez, director of the Andrés Castro center, explains that young children and youth are very enthusiastic about this initiative. The project is preparing them for a better academic future and professional development. “Our inventory consists of between 70 and 110 plants,” says Cesia, while Anielka interrupts her and states that approximately five hundred cordobas (C$500) are earned each month. “Some of this money has been used to buy paint for a classroom and, with the remainder, we have invested in more seedlings for the nurseries,” Anielka concludes. The group of enterprising boys and girls of the Andrés Castro school is made up of 25 students. “We all work as a team, from acquiring the plant or tree, to selling it. We work together to take care of our environment,” says young Yerald.